Blending the craft of fine soap making with sophisticated minimalistic aesthetics, #42 offers a contemporary take on traditional soap bar. This handmade cleansing bar made of goat milk and olive oil moisturizes the skin immediately, soothes and softens. Pink clay has an excellent cleansing effect, improves skin tonus and softens it. Essential oils of bergamot and verbena have beneficial effects on acne while sweet orange oil kills bacteria. All #42 soap bars are made of highest quality ingredients and do not contain irritating artificial colors, preservatives and foams. Gentle enough for all skin types. This item will be again available in February. Highest quality ingredients, use of environmentally friendly raw materials, combined with sophisticated minimalistic aesthetics is the main concept behind young Slovenian brand #42. Hand-crafted and packed in small numerical series, each product is made with love, care and great attention to detail. All of the unnecessary elements are taken out of the product, as well as from the packaging, to expose the »beauty of simple« and respect for the nature. Products do not contain irritating artificial colors, preservatives and foams that in the long term destroy natural balance of skin. 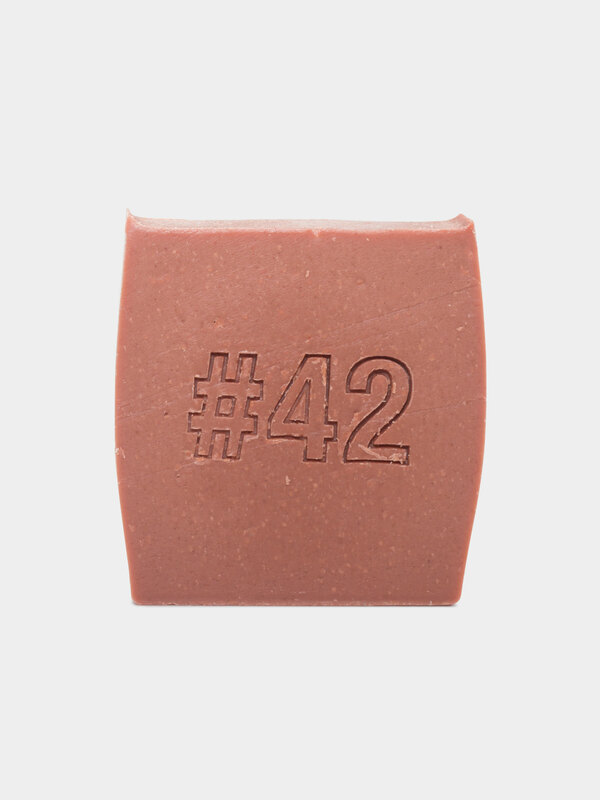 All #42 grooming products are based on the use of goat milk, which contains pH nearly identical to the human skin, while on the other hand also contains a number of vitamins such as A, D, E, B6, B12, phosphorus, potassium and calcium that restore and regenerate the damaged skin tissue. Alpha hydroxy acids help remove dead skin cells, smooth the skin and restore its elasticity and shine. For highly hydrated, soothed and smoothed skin. Directions for use: Apply evenly over wet skin, lather, and rinse thoroughly.